Former U.S. cadet nurse Aiko “Grace” Obata Amemiya will speak about her experiences serving in the U.S. Cadet Nurse Corps during World War II on Saturday, May 18, at 2 p.m. at the Japanese American National Museum, 100 N. Central Ave. in Little Tokyo. Born and raised in Northern California, Amemiya was student at the University of California School of Nursing when the U.S. declared war on Japan. Along with thousands of other Japanese Americans, she and her family were forcibly removed from their home and incarcerated at the Turlock Assembly Center and later at the Gila River Relocation Center in Arizona. She continued to work as a nurse’s aide at both camps. In February 1943, Amemiya was able to leave camp and continue her nursing studies at St. Mary’s University in Rochester, Minn. She then enlisted in the U.S. Cadet Nurse Corps and served proudly for six months at Shick General Army Hospital in Clinton, Iowa. 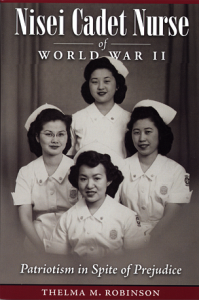 To learn more about this subject, read “Nisei Cadet Nurse of World War II: Patriotism in Spite of Prejudice,” which tells the story of 19 Japanese American women. It is available from the Museum Store.